On Friday morning, January 25th, President Trump announced that a deal had been reached to open the government until February 15th. The deal does not include a $5.7 billion down payment on a border wall, making it the same deal the president rejected back on December 19th. 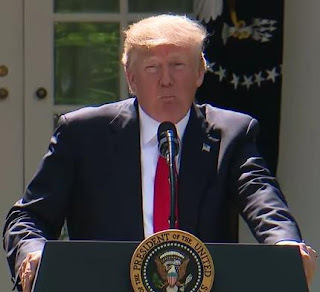 Subject: President Trump at White House garden podium | Photographer: White House Photographic Office |As a work of the U.S. federal government, the image is in the public domain. Whether we wanted to, or not, we have all just watched the world's longest poker hand. Nancy Pelosi held four aces, while Trump kept betting with a busted flush. Eventually he had to fold. The question is ,why did he fold, seemingly out of the blue, when he did? It could have something to do with the fact that LaGuardia Airport, where Trump keeps his private jet, was mere hours away from chaos. Unpaid air traffic controllers had called in "sick" for the upcoming shift and flights were being cancelled as a result. It is also possible that Trump was trying to take control of the news cycle. That morning the FBI raided the home of Roger Stone. Stone had been a close friend and advisor to Donald Trump for decades. The arrest may bring Mueller's investigation that much closer to Trump's doorstep. He may have been trying to distract America by announcing the end of the shutdown. Whatever the reason one thing is clear, after 35 days of chaos Trump got nothing accomplished. He needs to give up on the idea of a wall or we will have another shut down in three weeks. Of course, in two years whoever runs against Trump will be able to point to the 35 day debacle as proof that Donald Trump is willing to hurt Americans to further his own racist agenda. If nothing else, he has ensured that a democrat will win the White House in 2020. Labels: Race Relations, Washington D.C.